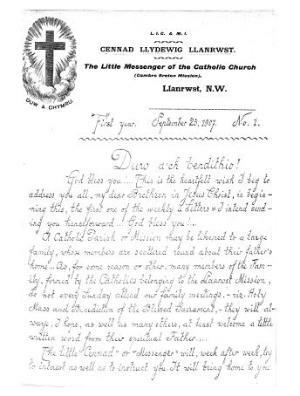 The monthly bilingual religious periodical of the Catholic Church's Cambro-Breton Mission based in Llanrwst. The periodical's main contents were religious articles and denominational news. The periodical was edited by the Breton priest, G. M. Trebaol. Associated titles: Cennad Catholig Cymru (1912).